We often find checker pieces set in small size enough, which use for indoor play. People like to play checker in their living room with their family or friends. Enjoy the checker game with cup of coffee in the evening, seems interesting activity in the weekend. Basically, checker is an easy game, so all ages can try to play it. You just need flat area, a checker board and checker pieces set. This time we introduce you big checker pieces that has made from Teak wood material. 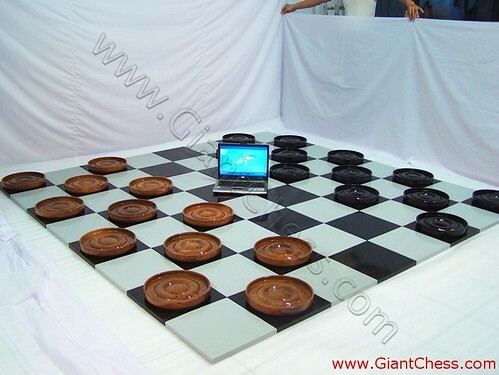 It also supported with big checker board, which has designed to suit with the checker pieces size. The board also made from Teak wood and both of checker pieces and board are carved by expert craftsman. Those are polished well in dark and light colors with glossy touch, make them looks so elegant. This big checker set and board are perfect for outdoor game, because you may need an enough area to put the board. Enjoy your new checker pieces in big size at your garden or backyard.